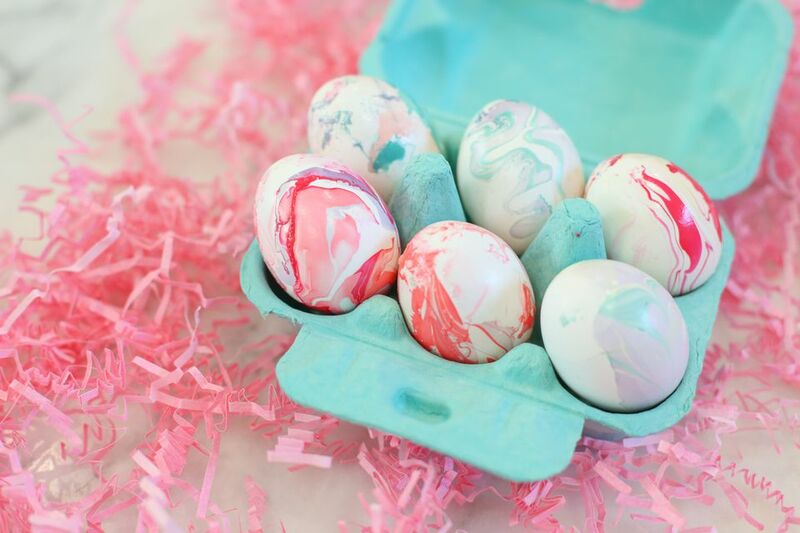 Easter is on the way, and it's the perfect time to get your holiday craft on! We love dreaming up different ways to decorate Easter eggs, and the possibilities are endless once you think outside the egg-dyeing box. This no-dye method of marbling is fun, fast, simple, and creates the prettiest colorful swirls. And the best part is that you probably have all of the materials you need right at home already. So grab some eggs and get ready to get your swirl on! Start with a bowl of clean room temperature water. Gather your supplies and have all of your nail polish nearby and open. Once you start, you'll need to work fast so that the nail polish doesn't dry out too soon. We recommend thoroughly reading through all the steps before beginning the project. Choose your first polish color. Use the nail polish brush to drip a few drops of the color onto the surface of the water. You'll want to work quickly but carefully; drop from just about an inch or so above the surface of the water (any higher and the polish will sink to the bottom). You'll notice that the polish will start to spread once it hits the water. Quickly continue in the same manner with your second color, dripping a few drops of each over the top of the first color. Spread them around the surface of the water at random. They should start to swirl around each other a bit. If you wish, you can continue adding more colors in the same manner. We find that three colors tends to work well to create a nice swirl. Use a toothpick to gently swirl the polish around a bit more, creating a marbled effect on the top of the water. Hold an egg in your hands with fingers at the top and bottom. If you have an egg dipper, load the egg onto the dipper. Gently lower the egg onto the surface of the water so that the nail polish starts adhering to the egg. Roll the egg as you lower it further into the water so that the nail polish adheres to all sides of the egg. Once your eggs are marbled, set them on an egg carton or paper towel to dry. You may need to gently massage out any water droplets that got caught under the nail polish. If this is the case, just lightly press on the areas with water and work the water out toward the edge of the marbling. For marbling subsequent eggs, use a toothpick to clear off all remaining nail polish from the water's surface before adding new nail polish for another egg. Marble to your heart's content and set your eggs out on display.